Mrs. Renfro's is primarily known for their line of gourmet salsas that can be found in supermarkets all over the United States. The company, however, doesn't just make salsa. They have an enormous line of condiments, sauces, and jellies including barbecue sauce. Like their salsas, Mrs. Renfro's Barbecue Sauce is packaged in 16 oz. glass jars. The sauce is dark red with visible specks of spices. It's a medium/thick sauce, but pours quickly thanks to the wide open mouth of the glass jar. This sauce is ketchup based and falls neatly in line with the traditions of Kansas City BBQ. Despite being based in Ft. Worth, TX, Renfro Foods created a sauce to satisfy the masses with a sweet, familiar flavor profile that is accented slightly by liquid smoke and black pepper. Their is also a mild vinegar tang in the finish. Though the bite is muted almost completely when the sauce is heated. I used Mrs. Renfro's on separate occasions with two different cuts of pork. First, I served Mrs. Renfro's Barbecue Sauce on baby back ribs that I prepared for my parents. Rather than smoke the ribs, I lightly seasoned them and baked them in the oven. Finished with Mrs. Renfro's, the ribs were a carbon copy of what you would get from a typical bar and grill. The sauce has a good texture for ribs. It brushes on nicely and leaves a sticky coating on the bones with cooked into the meat for a bit. This week I pulled a recently smoked pork shoulder out of the freezer for dinner. I used the remainder of the Mrs. Renfro's jar for pulled pork. I heated the sauce to thin it a bit and poured it over the smokey pork. The flavors were a natural fit for the meat. Everyone enjoyed the pork, in part, because of the sauce. 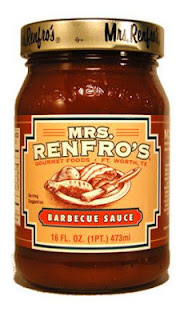 For a company whose primary focus is salsa, Mrs. Renfro's makes a pretty solid BBQ sauce. It's the type of sauce that has wide appeal. It's safe to serve to just about anyone. The flavors are pleasant, but mild. The medium thickness also makes it versatile enough for just about any application. It's hard to find anything objectionable about it. It probably won't WOW you, but you won't be disappointed. 0 Response to "Mrs. Renfro's Barbecue Sauce"